A Photoshop pattern is an image that is repeated, or tiled, when you use it to fill a layer or selection. Photoshop comes with various preset patterns, and there are many, many more available for free on the web. 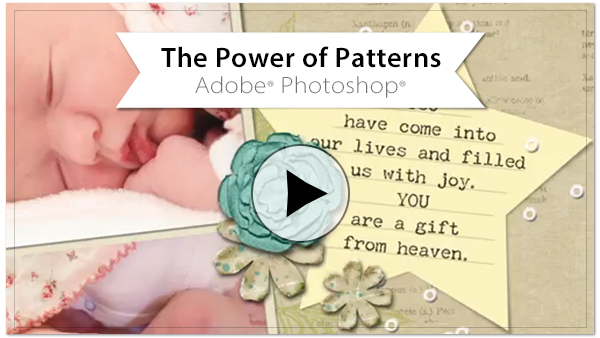 Photoshop patterns can be quite powerful IF you know how to use them. In this video tutorial I’ll explain all the basics, including some little known facts about patterns. I’ve even included a free pattern to begin your journey. Whether you’re just getting started in digital scrapbooking or are self taught and want to fill in the gaps in your education, the Learn Digital Scrapbooking class will help you get up to speed FAST and become the confident, competent digital scrapbooker you deserve to be. 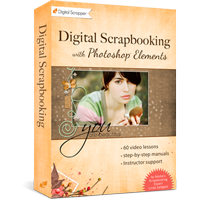 Learn more about the Learn Digital Scrapbooking class! This is a great tutorial. It has opened some great new possibilities to me as far as using patterns. Thank you so much for the free pattern – it is perfect to use in so many ways. Linda has by far THE very best classes for PS. I am so thankful I found her website and classes many years ago. She is thorough, concise, effective and just plain fun. I loved her videos when I was just getting started in PS and love to add to my skills now that I even teach PS myself. The very best!! Thanks for this tutorial. I haven’t done anything with patterns before because I haven’t taken the time to research them. Your video was very easy to understand. Thank you very much for this tutorial and the download with which to practice. I have recently been using patterns. As you explained, patterns can be quite useful. They are not hard to make. Thank you for sharing your knowledge with us! First click on the video button to access the video version you want—Photoshop or Photoshop Elements. A new page will come up with the video and the written instructions below the video. The link to download the pattern is in the first paragraph below the video. When I filmed the video I was intending to create a mini class on how to create and use patterns, but I haven’t gotten that done yet. But eventually I hope to do that. Thank you for that wonderful tutorial and the free pattern. You make everything so easy to comprehend and use. Thank you for this Linda. I always learn something from your lessons and love learning by video. Very nice tutorial! You could also combine all the layers to a Smart Object. That’s a whole other ball game, though. I use them and love them, but, it took time to understand them and employ them into my work. As long as I’ve used and made patterns, your style is so thorough, I got more out of it than I expected. Thank you!